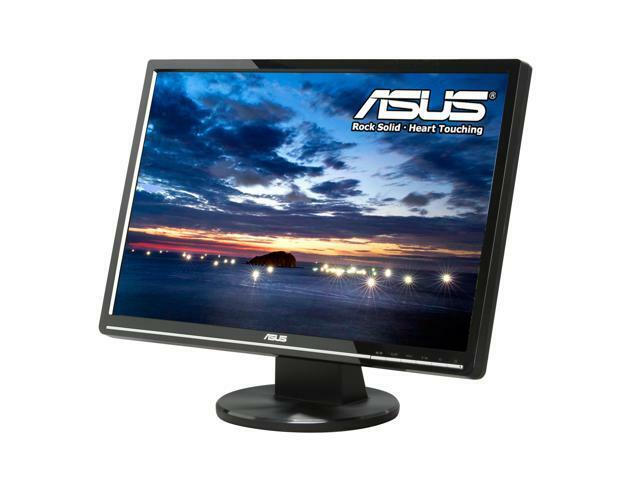 The large 22" Asus Splendid LCD monitor is a 16:10 widescreen display that provides true-to-life and stunning clarity multimedia experience with a 5000:1 (ASCR) contrast ratio and built-in speakers. The Asus exclusive Splendid Video Intelligence technology optimizes overall display for the best results in image preview, movie playback and gaming, with five preset modes (Standard, Game, Scenery, Night View and Theater) and 3 skin tone presets for more natural-looking human subjects on screen. You will enjoy optimized colors for various multimedia entertainment scenarios on the VW224U. Whether you're rendering video or graphics, enjoying your photos and movies, or gaming, you won't believe your eyes when you see the stunning color and clarity of the Asus VW224U. ASCR (ASUS Smart Contrast Ratio) Technology ASCR Technology automatically adjusts the luminance of the backlight for better displays according to the image contents, and improves the contrast ratio to 5000:1 for more realistic depictions of night scenes during games or movies. Aspect Control function allows you to view pictures in its correct aspect ratio for true-to-life gaming or movie watching without any distortion or stretching. Trace Free Technology Asus Trace Free technology delivers super-fast 2ms GTG response time for smoother motion video without image delays and ghosting. Built-in Stereo Speakers The built-in speakers deliver full sound for an immersive entertainment experience while saving precious desk space. 20.2" x 15.94" x 8.27"
Other Thoughts: I've owned the monitor for the better part of a decade now. I just can't kill it. I've moved it several times. Dropped it, kicked it, plugged it in incorrectly. I cannot believe the bang for the buck deal this thing is. Pros: Bought this unit at a brick n mortar computer store in Overland Park, KS in August 2008. It's still working fine and has been for average 8-10 hours a day ever since I first powered it up. Cons: I paid right at $150 for this unit plus taxes. Other Thoughts: I like to see and own equipment which outlasts it's warranty and this unit has definitely done that. I wish all ASUS monitors would perform as reliably as this unit has. Pros: Excellent picture, no dead pixels even 3 years later. This monitor saw very heavy game usage, no ghosting or flickering. It has been through 3 computers, and no problems whatsoever. One of the best purchases on a monitor I have ever had. Other Thoughts: I am buying a new monitor to replace this one, but not because it is dead or dying. I simply want a larger screen and that delicious 144mhz. Will be using this monitor as a second, as it works perfectly still. Other Thoughts: purchased in 2008 beginning of 09, this unit performs just as it was out of box and it's almost 2014. Game Mode is a great surprise as some games are a bit hard to see with the natural settings. Cons: My only con about this monitor when mounted to the wall you have this piece of plastic hanging from the bottom of it and it really makes it look ugly and wont fit against the wall flat with a wall mount. The speakers are junk and sound like a tin can, but who uses the monitor speakers for a pc. Other Thoughts: The monitor went all fuzzy withing 2 1/2 years but the manufacture honored the warranty and had to ship it out to them and they fixed it. Pros: This screen has worked as intended, no dead pixels, right out of the box. So far it has had over a year of heavy gaming and it continues to push through. Excellent monitor for the price. Pros: It's held up on me for quite a long time. Great for the price when I bought it, great display. Other Thoughts: This was an upgrade from the super old monitors of long ago, with their 600x800 and long backs. I've been pleased with the easy display and quality of the monitor. Pros: 4 years and I finally replaced this monitor. Why? Because I wanted to upgrade to HD for kicks and giggles. Nice, crisp picture, easy to use and reliable. It was my "television" for more than a year thanks to Hulu and NetFlix and it felt like I had a normal size tv as I watched at my desk. Cons: I have had no issues with this unit.